One of life’s great pleasures is to be found in mastering techniques that may be simple, but take practice. 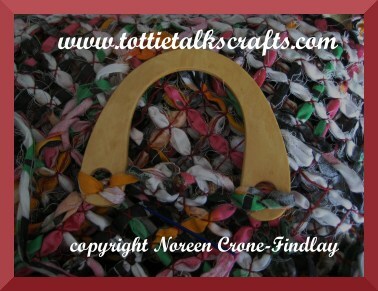 One of those very useful and satisfying skills is winding a center pull ball of yarn on the nostepinne. I like to wind a ball of yarn on the nostepinne in 2 stages. 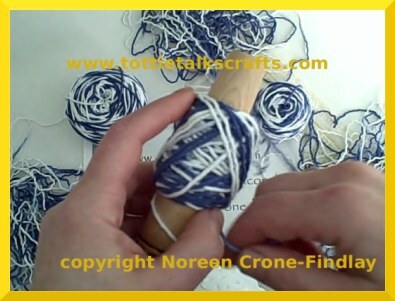 Here’s a little video that I made, showing how to wind lovely flat, stackable flat balls of yarn. The nostepinne is contemplative and portable, and to be honest, I much prefer it to my ball winder. 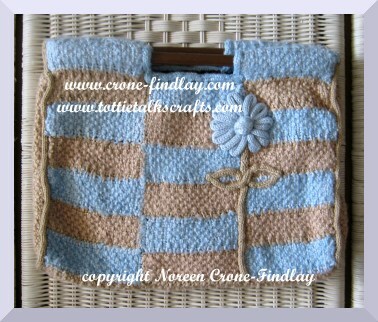 Potholder looms may be square, but! 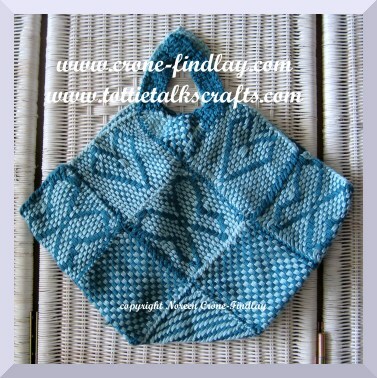 you don’t have to just weave squares on them!! I have figured out ways of weaving other shapes, too. 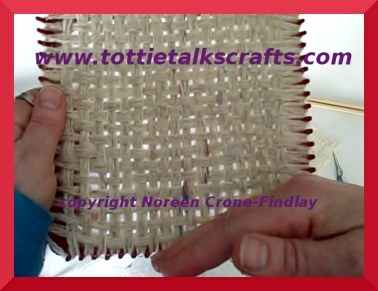 Last week, I decided to make a video of how to weave rectangles on the potholder loom. We were in the middle of a nasty springtime cold snap. March was really doing it’s lion in winter routine. brrrrrrrrrrrr. 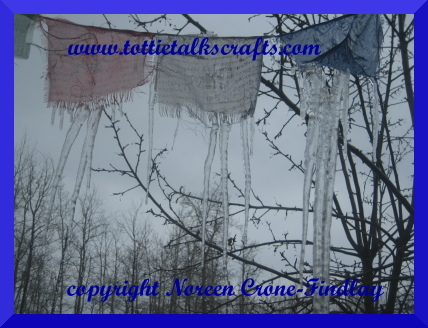 It was so cold that we had amazing icicles on the prayer flags outside the studio window. 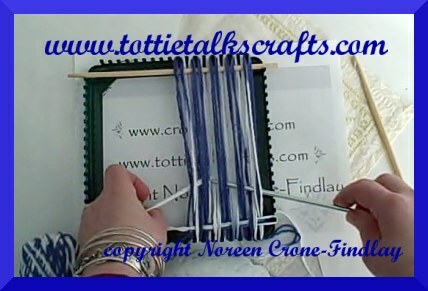 I wimped out of going with my husband to walk the dogs and opted to work on making a video of how to weave a rectangle on the potholder loom. I was just about finished the video when my Best Beloved burst into the studio, and with great gusto cussed out the cold weather. I instantly cracked up, and when he saw that I had been making a video, he blushed and apologized profusely. I deleted the video and started over. I was still laughing my head off when I started the next take, and it took me a minute to get myself composed again. I went off and did something else, and forgot about the goofiness on the video, and hit upload. It took hours and hours to upload it, and when I checked it… oh no! there was my chortling about my hubby’s little out take! How long can it take to make a 10 minute video? LOL…. all day! First of all…. you need to plot out how many looms you need to have on the go, and then get them set up so they can be grabbed quick like a bunny to keep the video flowing. This means that each stage of the video has to be figured out, and just ‘that much’ weaving done on each of the looms. I had a total of 6 looms on the go for this video. So… let the taping begin…. 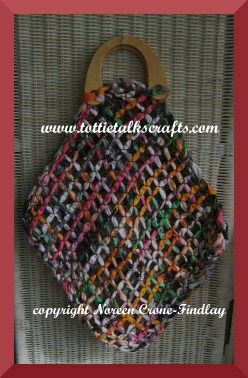 Take 5 went really well, until I was baffled at why the weaving suddenly just seized up. Oh… duh… I was standing on the yarn. sigh. Takes 6 and 7 each had unique little moments…. 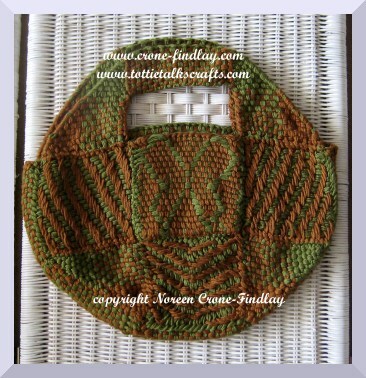 I snipped the yarn on one of the squares,…… that earned me a re-start. 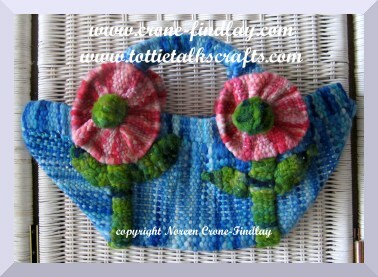 I BROKE the weaving hook in Take 7…. 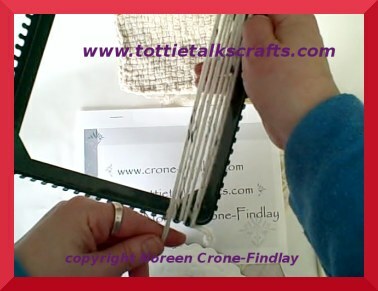 I have NEVER broken a weaving hook before, and Clever Clogs, I managed to do it in the middle of a video take. Throw that for a lark. Go out to workshop and carve a new hook. Take 8: The greyhound sees deer in the yard. He rushes to the door and pounds on it to take his barking and yelping outside. Take 9: Small dog decides to join the fray…. Take 10…. Brain locks up and tongue does a tap dance. I AM GOING TO GET THIS VIDEO DONE! and that is that…..
Take a deep breath…. forget about Takes 1 – 10…. oh please oh please, may my brain stay in motion, may my hands go where they are meant to, may my feet stay off the yarn, may the dogs puhleeeeeeeeze not go daft again…. And then, it’s done…. take a deep breath… and attempt to upload the video! Fingers crossed… and…. yes! it’s a go! 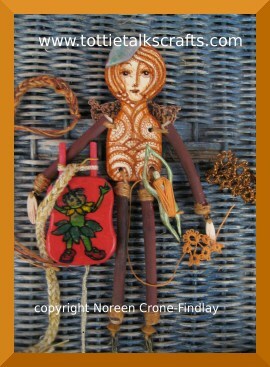 Please note: Everything on this blog is Noreen Crone-Findlay’s original, design, concept and work, and is copyright. Please do not copy without Noreen Crone-Findlay’s permission. Thank you! 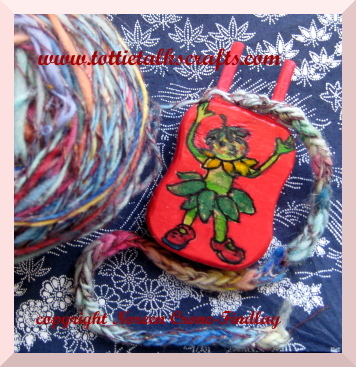 I love making little presents that I can just pop in an envelope and mail to family and friends. 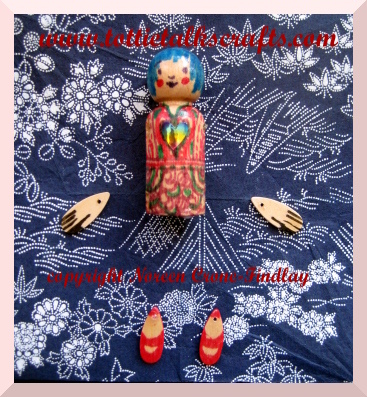 Yesterday, I had a flash of inspiration…. well, really it was several flashes of inspiration that came together ever so nicely! Lately, I have been blogging about doodling, Link and Link , so that’s kind of noodling around in the outer reaches of my brain. 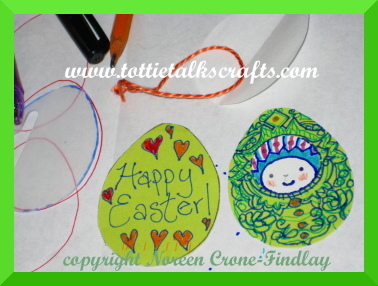 These all got me thinking about threads all came together and inspired me to design and make some oh so sweet paper eggs that can hang in a houseplant, a tree or be used as a bookmark or in scrapbooking. First of all, I drew an egg shape, and then I made a tracer or template from a piece of plastic from the recycling box. Then, I traced around it on a used envelope (gotta love being green! re-duce, re-use, recycle, reclaim, upcycle!) and cut out 2 eggs. (Front and back). 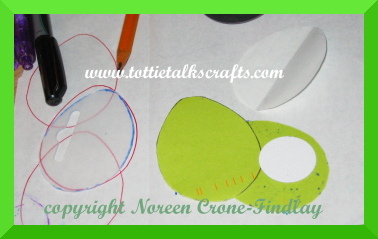 Then I cut out an inch diameter circle of white paper (use whatever color works best for your choice of skin tone). I snipped about 4 inches of embroidery floss for the hanger. Draw the face on the circle and glue it on the front egg. I doodled merrily away on the front of the egg, and then, because this one is going to my mom, I wrote a message on the back. 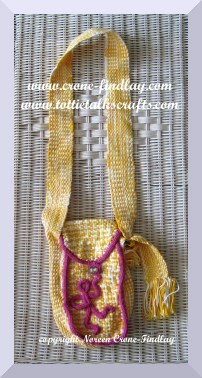 Glue the thread in a loop to the inside of the back and then glue the front to the back….. and Voila! 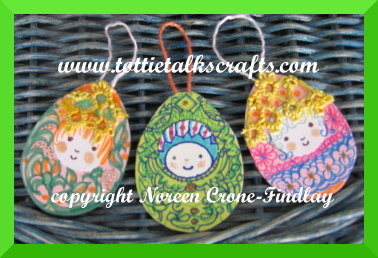 Adorable paper eggs to celebrate springtime! 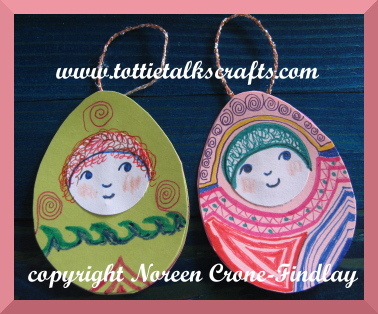 This tutorial is Noreen Crone-Findlay’s original concept and design. Please DO NOT COPY the text or photos. Please do share the link! Thanks so much!!! I also said that I would share a few bloopers with you. I checked the book to see what the final name of the bag on the right was (it started out as ‘Market Bag on the Square’). Then I cracked up, because, I have done revision after revision, and re-reads, and checks and checks and proof read after proof read, and I just noticed ~NOW~?!?!?!!? that this bag got bumped? eegads and little fish. I don’t know why that struck me as being so funny, but it did. So, The Market Bag on the Square isn’t so much an ‘out take’ as a ‘take out’…. 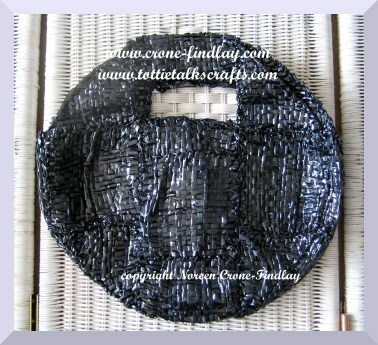 Having eco and green and upcycled components to the book was really important to me. 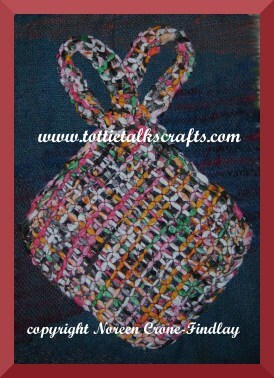 I am really pleased with the reclaimed fabric torn into strips, and used instead of yarn in the body of the bag. 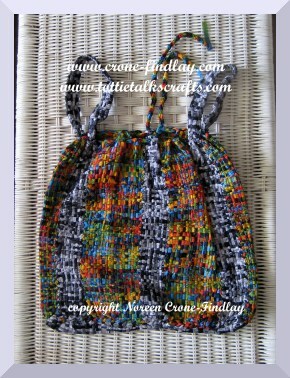 What I don’t like, is that I was experimenting with the handles for the bag, and I don’t much like the fabric handles. So… I have done some revision. It’s still in the spirit of upcycling, as the handles were re-claimed and are being re-used, and I am much, much happier with it now. 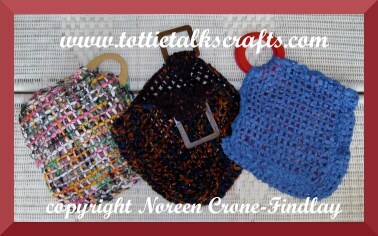 So, there you have it… a few ‘out takes’ and ‘take outs’ from The Woven Bag! Oh yes! I forgot to say yesterday, that I have started a group on Facebook for The Woven Bag, and people are starting to post pics of the bags that they are weaving. You are MOST welcome to join and post pics of your bags, too! Last week, I got the nicest letter from a lady. 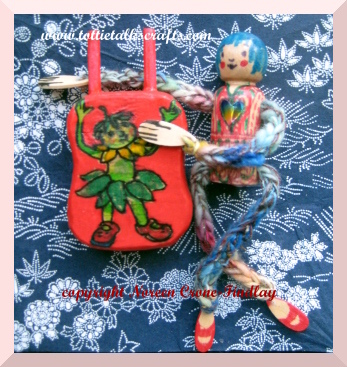 She said that she had pre-ordered a copy of The Woven Bag…. BUT…. other bags in the book. a workshop at her fingertips. and got the camera out…. so, here’s another look inside the book! Tomorrow, I am going to share a couple of little blooper secrets from the book… stay tuned…. 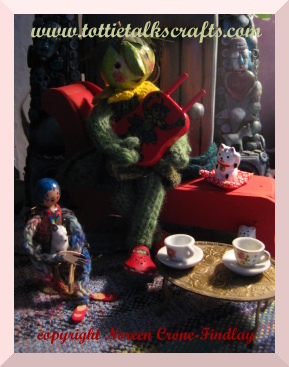 Tottie Tomato is always up for a tea party. Today, she’s sipping tea with a group of teddy friends. Some of her teddy friends are really tiny. One little mischievous fellow decided to go for a little dip in his teacup, which raised a few eyebrows. Other than that slight social faux pas, the tea party was a great success. 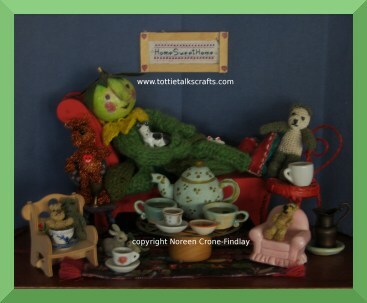 What’s the story behind Tottie’s tea party today? Well, the other day, a lady asked me if I still had copies of my Crocheted Teddy Bears book. I checked on my shelf, and realized that I did, but only had 2 copies left and that I had tagged it to transpose it into pdf format. So, I spent the day and evening working on re-building the book as an eBook.While I was working on building the pdf’s, I wondered what had happened to the original teddies from the book. 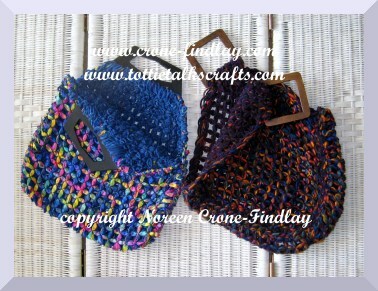 I had crocheted a really enormous one, and knew that I had given that one away, as I just don’t have room to store it. I knew I had several of the tinier teddies from the book scattered around the studio, but it took some searching to find them. Some of them completely eluded me, but I just remembered that there is a collection of them in my workshop boxes, so I will have to see if I can lay hands on them. I love crocheting teddies with unusual materials. 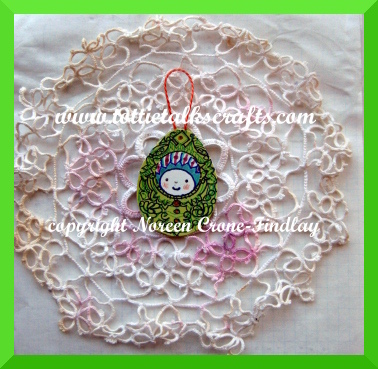 Do you see the teddy bear that I crocheted from wire? He’s the one who’s whispering secrets into Tottie’s ear. 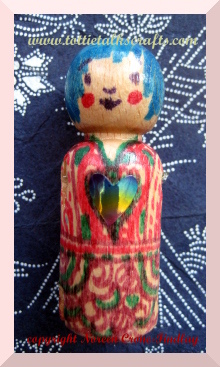 Because he’s kind of see-through, I put some precious objects inside him, which then makes him even more special. I have stitched pins on the backs of the other really tiny bears, and I wear them as pins. A friend made me the naughty little one in the teacup, and spool knitted a cord onto it to turn it into a fine little bookmark. So, you see, teddy bears can do more than just sip tea! They can do all manner of important things. But, when you think about it, really, all a teddy bear REALLY needs to do, is to just be him or herself. A lesson that we all could learn from, yes? 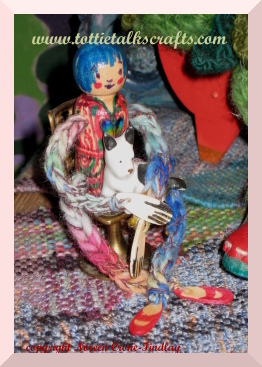 My friend, Pirk, posted a note to the International FreeForm Fiber Arts group, that has triggered all kinds of inspiration for the members of the group- me included! 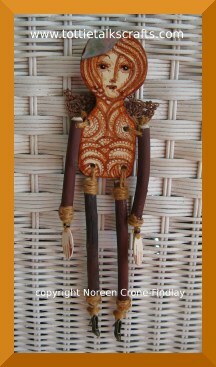 as inspiration in doll making. 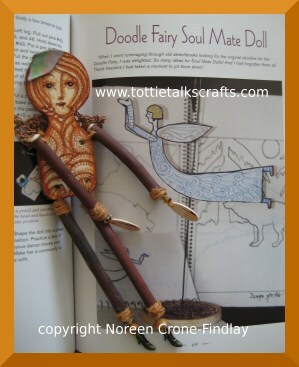 Soul Mate Dolls: Dollmaking as a Healing Art. We made it 4 years ago. To no avail. Same response. She was very firm about what she wanted, but it took me awhile to hear what she had to say. What she wanted was: Twigs. Yep. Twigs and only twigs. Thank you very much. As soon as I , pardon the pun, ‘twigged’ to that, things went swimmingly! Same thing with her hat. I was sure that she needed a crown. Several color combinations and different thread versions later, I finally got it that all she wanted was a little piece of something natural. And, a fragment of abalone shell was perfect thank you very much. 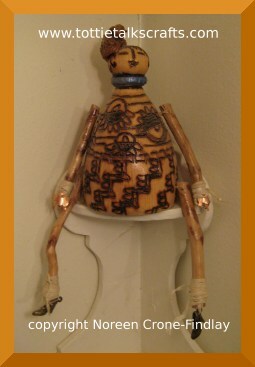 And, so, Potentianna is now happily completely herself and is hanging on the wall of the studio, beckoning me to pick up my pens and start doodling her some sisters and friends and family…. Oh yes! speaking of friends! I need to mention some other friends who are seriously into doodling…. Margaret is so delighted with the Zentangle system of drawing that she is about to become a certified teacher. How neat is that? 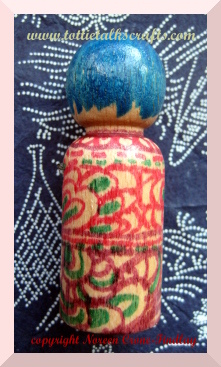 So, whether you like to freeform in your doodling, or use your doodles for dollmaking, like I do,or your crochet, like Pirk, or your mandalas, or are intrigued by the delightful possibilities of the Zentangle system, I encourage you to pick up you pens and pencils and get doodling! Happiness awaits…. it’s right at the tip of your pencil….